I honestly don’t remember where I got this recipe, I think it was Delish.com, but could not find it there again. 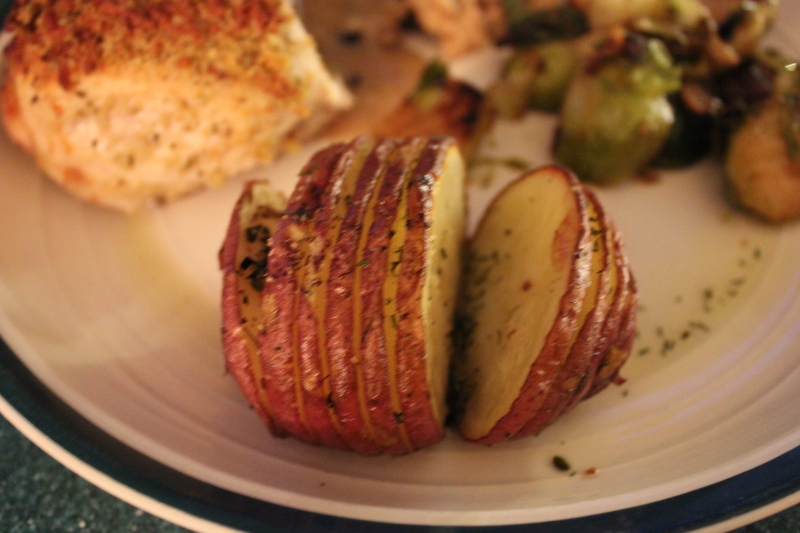 I will be honest they came out great and are a wonderful way to present potatoes. The cutting is the part I had a hard time with. You want to cut them close enough to the bottom so they “fan” out when cooked but not so close that you cut through or that they fall over, if I could give a bit of a hint if you will, on the ends don’t try to cut to the bottom you will more than likely cut through and get frustrated. This would be a learning experience for me on this. With that being said they were perfect bite sized pieces of heaven. Not to crispy (which I was worried about) make sure to follow the recipe and you will do fine with these as your next side dish. Preheat oven to 450 degrees, carefully slice each potato without cutting all the way through. Place potatoes in the microwave for 12 to 15 minutes in an oven/microwave safe dish. Drizzle potatoes with the oil between the slices, salt and pepper the potatoes lightly. Raost in the oven for 20 minutes watching that they down over brown and crisp up. Sprinkle with the herbs and serve.